You know you want to see inside! POSTPONED DUE TO WEATHER -- NEW DATE TBA Satisfy your curiosity at the annual OPS Holiday Historic Homes Tour on Sunday, December 9th! 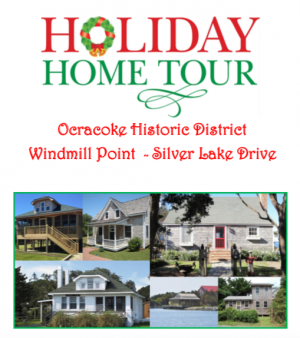 Six historic cottages will be open for viewing on Sunday, December 9, 2018 in conjunction with the 2ndAnnual Ocracoke Village Local Shopping Day event. Please join Ocracoke Preservation Society on Sunday, December 9, 2018 for this fun holiday tradition. With generous permission from the homeowners, OPS will highlight a special selection of homes in Ocracoke’s National Historic District. This year's tour features six cottages on Silver Lake Drive in the historic Windmill Point area, and includes one of the oldest surviving island structures. Kugler Cottage "Where the Sun Sets" -- one of the oldest structures on the island. You know you want to see inside! Begin at the Lonnie Burrus home (c. 1934), now known as Chadwick South. This charming cottage and its mirror image, Bebe’s, (the Celia and Enoch Sylvester Tolson house c. 1933, the second stop on the Homes Tour), are examples of the popular bungalow-style Ocracoke home. The youngest house on the tour is the rustic Summer Cottage, built in 1960 on part of the Barksdale property. Next is Serendipity, the c. 1888 Bragg-Tolson house, with classic cedar shake siding and a rare front cross-gable. Even older is the Kugler Cottage, which is believed to have been built in the mid-1800’s and moved to its location with the perfect sunset views in 1915. Lastly is the Meeker Cottage, built in the late 40’s from materials salvaged from the c. WWII Navy base on Ocracoke. The homes will be decked out in their holiday best, and will be open to view from 3–5pm. There’ll be refreshments, too! Parking is limited; Hyde County will offer free tram service from the NPS parking lot to the Historic Homes Tour area. Purchase or reserve your tickets for this event at the OPS Museum in person, or by calling 252-928-7375. Ticket prices are $15 for non-members, $10 for OPS members, and $5 for children. Ticket sales benefit Ocracoke Preservation Society. Also on December 9th: Shop Local! 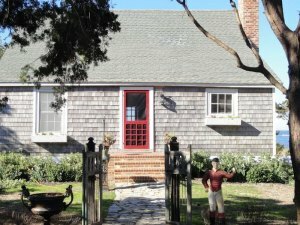 Nine unique Ocracoke businesses – Over the Moon, Island Artworks, Village Craftsmen, Ride the Wind, Pirates Chest, Mermaid’s Folly, Island Ragpicker, Books To Be Red, and the OPS Museum Gift Shop – will be open from Noon–4pm. Bring your purchases to the OPS Museum where the Ocracoke School 1st and 2ndgraders will wrap your gifts as a special classroom fundraiser.